Clients: 10 teenage girls aged between 14-17 who had been referred to the Sistahood Secrets program by school teachers and counselors to help improve their coping skills, social skills, and self esteem. Using the affirmation box idea as inspiration I decided to combine art therapy with positive thought reprogramming in the following activity. I introduced the group to the idea that we create and control our own thoughts so it is much better to input more good thoughts into our brains than negative because that then creates our ‘screensaver.’ The screensaver then filters our responses, emotions, patterns, thoughts etc to situations that arise in our lives. We spent 45 minutes creating our own little ‘feel good’ safe boxes….a beautiful safe place to store our positive thoughts. Once the boxes were completed we set them aside to dry and started creating our own affirmation cards. I provided them with template affirmations they could choose from or they could create their own if they could identify certain things that they wanted to work on, or be reminded about each day as they chose a card from their box. Outcome: The group seemed very engaged in their activity and it provided me with an opportunity to spend one on one time with the girls in the group, finding out why they were choosing the colours/textures/patterns they were and discussing further the idea of filling our brains with positive programming rather than negative. There was no disruptive behavior and the girls all achieved completion f their feel good boxes and affirmation cards within the session. 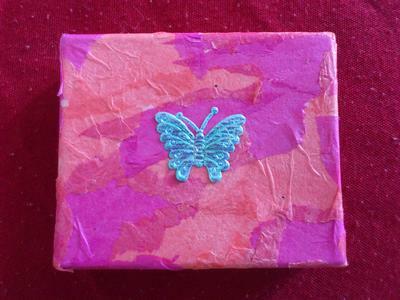 In preparation for the class I also spent time creating my own pink and blue collaged box with a butterfly symbol (for transformation) on the lid and have it stored in a special place in my bedroom for when I need a positive pick me up!